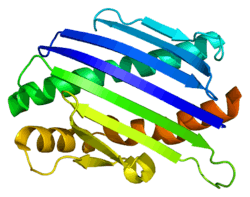 The protein is also involved in Plasmodium falciparum malaria as subtypes of the P. falciparum erythrocyte membrane protein 1 (PfEMP1) family use EPCR of the host as a receptor. ↑ "Diseases that are genetically associated with PROCR view/edit references on wikidata". 1 2 3 "Entrez Gene: PROCR protein C receptor, endothelial (EPCR)". ↑ Turner L, Lavstsen T, Berger SS, Wang CW, Petersen JE, Avril M, Brazier AJ, Freeth J, Jespersen JS, Nielsen MA, Magistrado P, Lusingu J, Smith JD, Higgins MK, Theander TG (2013). "Severe malaria is associated with parasite binding to endothelial protein C receptor". Nature. doi:10.1038/nature12216. Esmon CT (2004). "Coagulation and inflammation.". J. Endotoxin Res. 9 (3): 192–8. doi:10.1179/096805103125001603. PMID 12831462. Ruf W, Dorfleutner A, Riewald M (2003). "Specificity of coagulation factor signaling.". J. Thromb. Haemost. 1 (7): 1495–503. doi:10.1046/j.1538-7836.2003.00300.x. PMID 12871285. Van de Wouwer M, Collen D, Conway EM (2005). "Thrombomodulin-protein C-EPCR system: integrated to regulate coagulation and inflammation.". Arterioscler. Thromb. Vasc. Biol. 24 (8): 1374–83. doi:10.1161/01.ATV.0000134298.25489.92. PMID 15178554. Medina P, Navarro S, Estellés A, España F (2007). "Polymorphisms in the endothelial protein C receptor gene and thrombophilia.". Thromb. Haemost. 98 (3): 564–9. doi:10.1160/th07-01-0071. PMID 17849044. Raheja KK (1977). "Nursing in transition.". Nursing forum. 15 (4): 413–7. doi:10.1111/j.1744-6198.1976.tb01065.x. PMID 1051893. Laszik Z, Mitro A, Taylor FB, et al. (1998). "Human protein C receptor is present primarily on endothelium of large blood vessels: implications for the control of the protein C pathway.". Circulation. 96 (10): 3633–40. doi:10.1161/01.cir.96.10.3633. PMID 9396465. Ye X, Fukudome K, Tsuneyoshi N, et al. (1999). "The endothelial cell protein C receptor (EPCR) functions as a primary receptor for protein C activation on endothelial cells in arteries, veins, and capillaries.". Biochem. Biophys. Res. Commun. 259 (3): 671–7. doi:10.1006/bbrc.1999.0846. PMID 10364477. Simmonds RE, Lane DA (1999). "Structural and functional implications of the intron/exon organization of the human endothelial cell protein C/activated protein C receptor (EPCR) gene: comparison with the structure of CD1/major histocompatibility complex alpha1 and alpha2 domains.". Blood. 94 (2): 632–41. PMID 10397730. Hayashi T, Nakamura H, Okada A, et al. (1999). "Organization and chromosomal localization of the human endothelial protein C receptor gene.". Gene. 238 (2): 367–73. doi:10.1016/S0378-1119(99)00360-1. PMID 10570964. Liaw PC, Neuenschwander PF, Smirnov MD, Esmon CT (2000). "Mechanisms by which soluble endothelial cell protein C receptor modulates protein C and activated protein C function.". J. Biol. Chem. 275 (8): 5447–52. doi:10.1074/jbc.275.8.5447. PMID 10681521. Xu J, Qu D, Esmon NL, Esmon CT (2000). "Metalloproteolytic release of endothelial cell protein C receptor.". J. Biol. Chem. 275 (8): 6038–44. doi:10.1074/jbc.275.8.6038. PMID 10681599. Liaw PC, Mather T, Oganesyan N, et al. (2001). "Identification of the protein C/activated protein C binding sites on the endothelial cell protein C receptor. Implications for a novel mode of ligand recognition by a major histocompatibility complex class 1-type receptor.". J. Biol. Chem. 276 (11): 8364–70. doi:10.1074/jbc.M010572200. PMID 11099506. Biguzzi E, Merati G, Liaw PC, et al. (2002). "A 23bp insertion in the endothelial protein C receptor (EPCR) gene impairs EPCR function.". Thromb. Haemost. 86 (4): 945–8. PMID 11686350. Galligan L, Livingstone W, Volkov Y, et al. (2001). "Characterization of protein C receptor expression in monocytes.". Br. J. Haematol. 115 (2): 408–14. doi:10.1046/j.1365-2141.2001.03187.x. PMID 11703343.
von Depka M, Czwalinna A, Eisert R, et al. (2002). "Prevalence of a 23bp insertion in exon 3 of the endothelial cell protein C receptor gene in venous thrombophilia.". Thromb. Haemost. 86 (6): 1360–2. PMID 11776299. Deloukas P, Matthews LH, Ashurst J, et al. (2002). "The DNA sequence and comparative analysis of human chromosome 20.". Nature. 414 (6866): 865–71. doi:10.1038/414865a. PMID 11780052. Oganesyan V, Oganesyan N, Terzyan S, et al. (2002). "The crystal structure of the endothelial protein C receptor and a bound phospholipid.". J. Biol. Chem. 277 (28): 24851–4. doi:10.1074/jbc.C200163200. PMID 12034704. Riewald M, Petrovan RJ, Donner A, et al. (2002). "Activation of endothelial cell protease activated receptor 1 by the protein C pathway.". Science. 296 (5574): 1880–2. doi:10.1126/science.1071699. PMID 12052963.